Optimizer PRO Free Trial to Jan 31, 2019! In the latest version, SERVOsoft® v4.1.114 and newer, all users with a PRO license automatically get the Optimizer PRO option enabled as a Free Trial until January 31, 2019. Just install the latest version and run SERVOsoft! Don't just find a good solution. Find the optimal solution. The Optimizer PRO works at both ends of the drive chain. It works at the load by working with the motion profile to optimize various targets including time, motor torque, energy efficiency, peak power, etc. 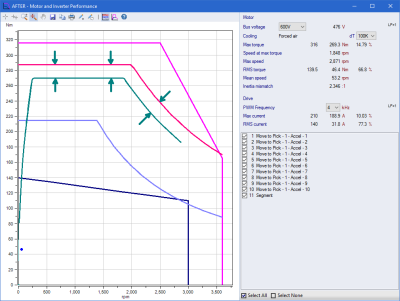 Curve Fitting, shown in the image to the right, works within the rated limits of the motor, gearbox, mechanism, inverter and infeed to find the optimal accel/decel ramp. Specify which components and the margin for each, and then Curve Fitting finds the optimal ramp. No guessing. No more "it's good enough". Now, with a click and within seconds, you get the optimal ramp profile. If you compete on performance, then Curve Fitting is a must! The Optimizer PRO is the only option offered in SERVOsoft v4. It must be ordered in addition to the SERVOsoft PRO version, which supports polynomials and splines that are required for the Optimizer PRO.